German winged orbital launch vehicle. 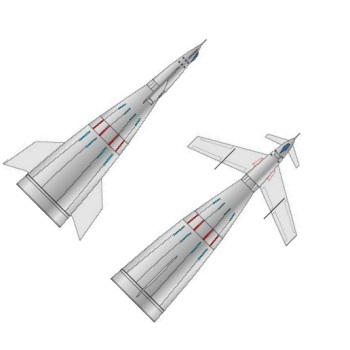 Von Braun's 1952 design for a reusable space launcher used the same mass and performance calculations done in 1948. 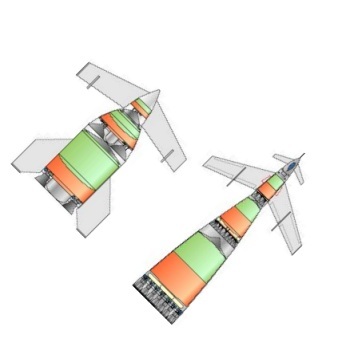 However the large parachute canisters were replaced by deployable drag skirts. This allowed the design to be substantially less squat and more elegant than the 1948 version -- but still fatter than the sleek paintings that appeared in print! AKA: A12. Status: Study 1952. Payload: 25,000 kg (55,000 lb). Thrust: 119,300.00 kN (26,819,700 lbf). Gross mass: 6,400,000 kg (14,100,000 lb). Height: 97.00 m (318.00 ft). Diameter: 20.00 m (65.00 ft). Apogee: 1,730 km (1,070 mi). LEO Payload: 25,000 kg (55,000 lb) to a 1,730 km orbit at 23.50 degrees. Stage 1. 1 x Von Braun 1952-1. Gross Mass: 5,500,000 kg (12,100,000 lb). Empty Mass: 700,000 kg (1,540,000 lb). Thrust (vac): 141,286.300 kN (31,762,424 lbf). Isp: 257 sec. Burn time: 84 sec. Isp(sl): 217 sec. Diameter: 20.00 m (65.00 ft). Span: 37.00 m (121.00 ft). Length: 36.50 m (119.70 ft). Propellants: Nitric acid/Hydrazine. No Engines: 51. Status: Study 1952. Stage 2. 1 x Von Braun 1952-2. Gross Mass: 770,000 kg (1,690,000 lb). Empty Mass: 70,000 kg (154,000 lb). Thrust (vac): 16,271.100 kN (3,657,889 lbf). Isp: 298 sec. Burn time: 124 sec. Diameter: 13.50 m (44.20 ft). Span: 13.50 m (44.20 ft). Length: 20.70 m (67.90 ft). Propellants: Nitric acid/Hydrazine. No Engines: 34. Status: Study 1952. Stage 3. 1 x Von Braun 1952-3. Gross Mass: 105,000 kg (231,000 lb). Empty Mass: 22,000 kg (48,000 lb). Thrust (vac): 2,033.800 kN (457,216 lbf). Isp: 296 sec. Burn time: 105 sec. Diameter: 5.80 m (19.00 ft). Span: 48.00 m (157.00 ft). Length: 23.40 m (76.70 ft). Propellants: Nitric acid/Hydrazine. No Engines: 5. Status: Study 1952. Family: orbital launch vehicle, Winged. People: von Braun. Country: Germany. Engines: Von Braun-3, Von Braun-1, Von Braun-2. Stages: Von Braun 1952-1, Von Braun 1952-2, Von Braun 1952-3. Bibliography: 218.